Move cursor to various parts of photo to zoom in on that location! 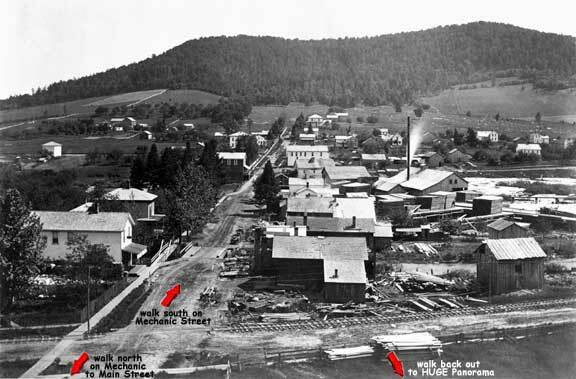 Mechanic Street in 1895 was the center of industry in Smethport. The several railroads all serviced the area as did many related service industries thus giving "Mechanic Street" its name. In the foreground is the railroad running down the present day Water Street. To the left is a bakery that was supported largely by the workers of the area industries. Several carriage shops and mechanic garages are in the center foreground just in front of the railroad tracks. Beyond the carriage shops toward the dam are the lumber mills followed by Barrett's Grist Mill just beyond the present Mechanic Street Bridge. To find out more about the buildings along this street click on the links below. If you would like to come back to this page, just click on the pictures.